Tomy has created many toy robots throughout the years and in the 80’s created a line of small Personal robots. They don’t have a true on-board programmable computer but are fun nonetheless. 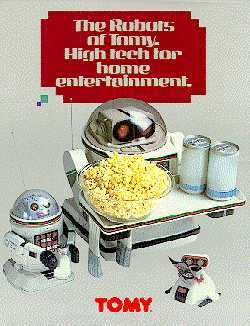 The top of the line was the Omnibot 2000 which could pour drinks on a special serving tray. The programming is done by recording the movement commands to a regular cassette tape which can be played back at certain times by using the built-in clock. That is about the extent of the programming. The specs below are for the Omnibot and the Omnibot 2000.